Bryan standing next to his poster at TAS. During the Ancient Southwest Texas Project’s 2015 Eagle Nest Canyon Expedition, the crew uncovered and sampled Feature 8—an earth oven pit and intact heating element complex near the back of Eagle Cave (see Between a Rock and a Heart Place). The dense concentration of large fire-cracked-rocks (FCR) and charcoal within the pit are classic characteristics of earth oven baking. Further, many of the limestone rocks were large (11-15 cm) in size and inclined in a basin-shaped configuration at the base of the pit. The matrix that surrounded these fire-cracked rocks (FCR) was heavily organic, ashy, rich with dime-size charcoal chunks, and almost entirely absent of artifacts. Plan and profile views of Feature 8 as originally exposed in Unit 25. Notice the large FCR, and how they are inclined towards the right. 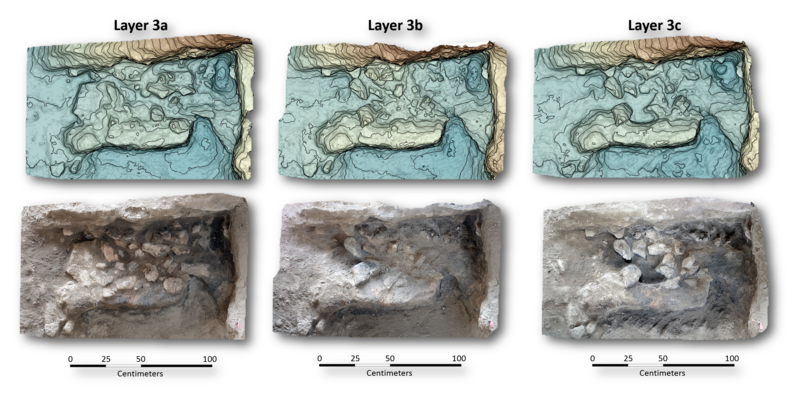 Digital Elevation Models (top) and orthographic photos (bottom) of Feature 8 during excavation of Unit 25 Layer 3. Contour interval is 2 centimeters. Elevations range from 980.138 meters (brown) down to 979.445 meters (blue). After initially exposing Feature 8 in Unit 25, Units 50 and 55 were opened up as sampling units. 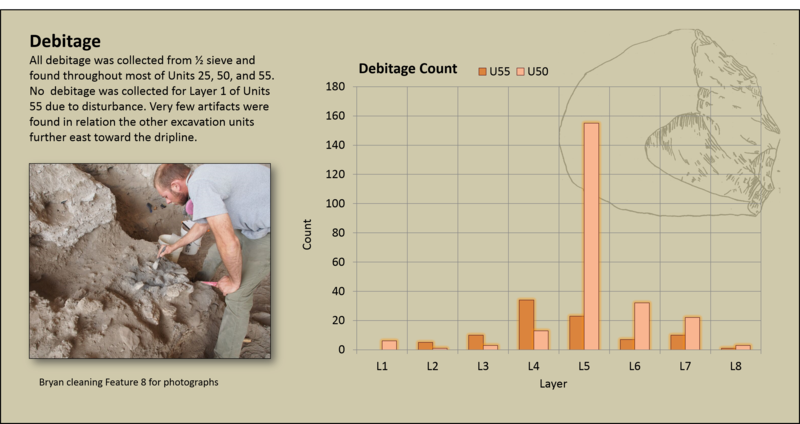 The two units were excavated following natural stratigraphic layers, and matrix samples were collected from each layer. Back in the lab, each matrix sample was sifted through a ½ inch sieve and all artifacts and were collected and bagged by type. The remaining matrix was split into 1 liter samples for curation and further analysis by our various colleagues (archaeobotany, geoarchaeology, and entomology). All rocks greater than 2.5 cm were added to the Rocksort data. 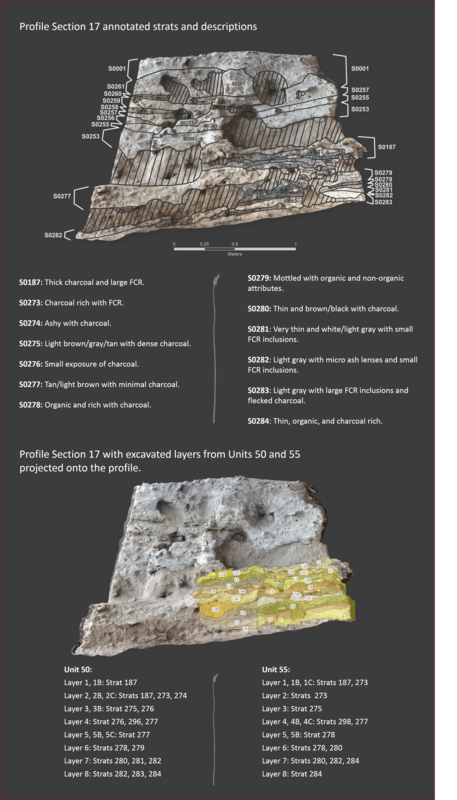 Profile Section PS17 is the east/west running profile of excavation units 50 and 55. After cleaning the profile, a 3D model was created using Structure from Motion (SfM) photography and the stratigraphic layers (strats) were annotated on an orthophoto of the profile. Based on the densities of large FCR (> 11-15 cm), organic soil, and heavy concentrations of charcoal, PS17 appears to be located in an area of Eagle Cave that has been used for repeated earth oven events over the centuries, of which the Feature 8 pit is just the most recent iteration. 1) Besides charcoal and other carbonized plant remains, there was no uncharred organic material in the Feature 8 complex. 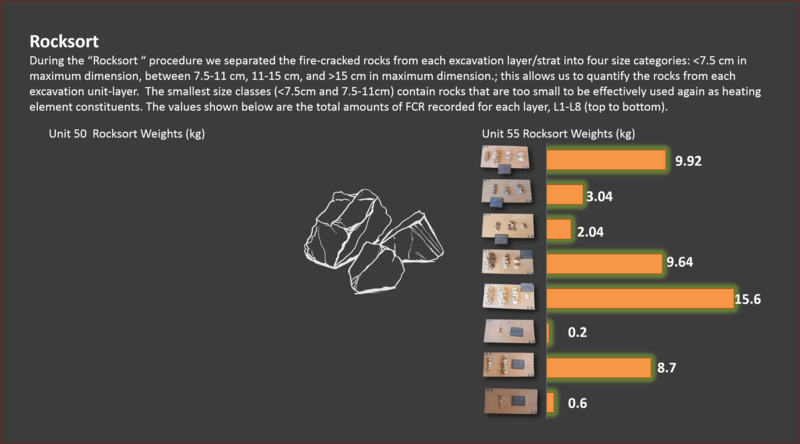 2) 110 + kg of burned limestone rock from Feature 8 was counted and quantified from Units 50 and 55. Many of these rocks were >15 cm, indicative of the “pristine” rocks expected in an earth oven heating element. 3) The amount of large FCR in the PS17/ F8 area relative to the units closer to the dripline, indicate that this area was favored for earth ovens pits. The tossing of discarded rocks during cleaning episodes would have sent smaller rocks and fiber toward the dripline. 4) A hard/cemented matrix was encountered in layer 3 of Units 55 and 50. The formation process and composition of this anomaly is awaiting further analysis. 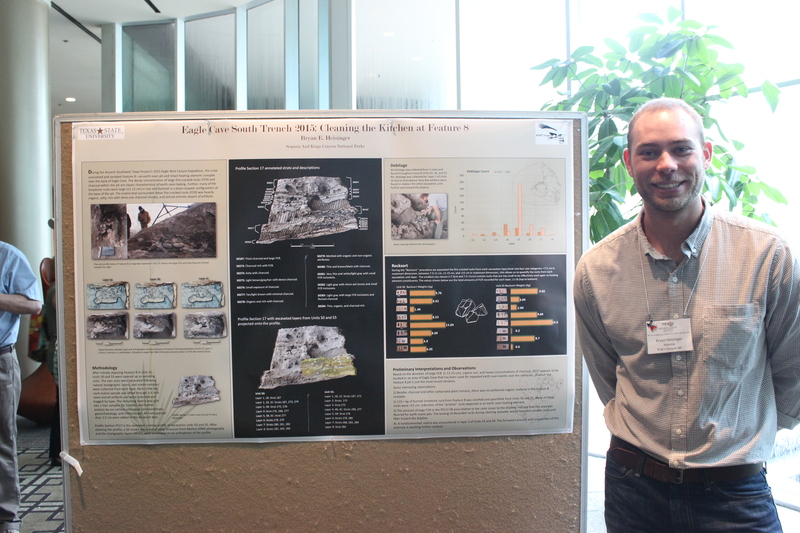 This entry was posted in 2015 TAS Poster Symposium, Eagle Cave, Earth Ovens, Fire Cracked Rock. Bookmark the permalink.